The 2013 Los Angeles Dodgers season was the Dodgers' 124th for the franchise in Major League Baseball, and their 56th season in Los Angeles. The Dodgers dealt with a series of injuries to key players during the first half of the season and on June 21 were 31-42, 9 1/2 games back in last place in the NL West. Beginning with a 6-1 win over the San Diego Padres on June 22, the return of the injured players, and the emergence of rookie Yasiel Puig, they went 46-10 through August 23 as the rest of the division collapsed. On September 19, they clinched the Western Division title. This was the earliest the Dodgers had ever clinched a title and the largest deficit they had ever overcome to win the division. They opened the playofives LA marquee name as hitting coach|work=Losangeles.dodgers.mlb.com }} On November 13, the Dodgers promoted bullpen coach Ken Howell to assistant pitching coach and named Chuck Crim as the new bullpen coach. 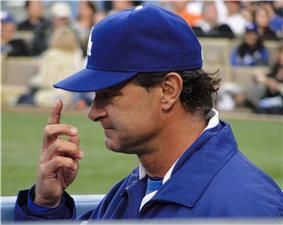 They also named John Valentin as assistant hitting coach. After the 2012 season several Dodgers players became free agents: pitchers Joe Blanton, Randy Choate, Brandon League and Jamey Wright, infielder Adam Kennedy and outfielders Shane Victorino and Bobby Abreu. The Dodgers also declined the 2013 contract options for pitcher Todd Coffey, backup catcher Matt Treanor and outfielder/first baseman Juan Rivera, making them free agents. On November 7, the Dodgers hired Mark McGwire to be the new hitting coach. The Dodgers began their offseason by re-signing closer  The Dodgers, on December 10, signed the top free agent pitcher, Zack Greinke, to a six-year, $147 million contract, the largest ever awarded to a right-handed pitcher. They signed left-handed relief pitcher J. P. Howell to a one-year, $2.75 million contract on January 8. On November 7, the Dodgers hired Mark McGwire to be the new hitting coach. On November 13, the Dodgers promoted bullpen coach Ken Howell to assistant pitching coach and named Chuck Crim as the new bullpen coach. They also named John Valentin as assistant hitting coach. The Dodgers began their offseason by re-signing closer  The Dodgers, on December 10, signed the top free agent pitcher, Zack Greinke, to a six-year, $147 million contract, the largest ever awarded to a right-handed pitcher. They signed left-handed relief pitcher J. P. Howell to a one-year, $2.75 million contract on January 8. 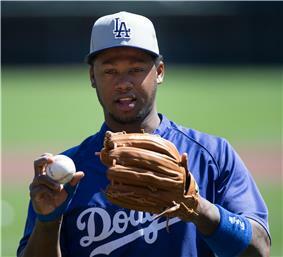 Several Dodgers players participated in the 2013 World Baseball Classic held during spring training. Kenley Jansen played for the Netherlands, Ronald Belisario for Venezuela, Nick Punto for Italy, Luis Cruz and Adrian Gonzalez for Mexico, and Hanley Ramirez for the Dominican Republic, as well as minor leaguers Andres Santiago and Mario Santiago for Puerto Rico and Felipe Burin for Brazil. In the WBC Championship game, Ramirez injured his hand while diving for a ball. An MRI the next day revealed a torn thumb ligament which would require surgery. The Dodgers announced that he would miss the first two months of the season while recovering. The Dodgers went back on the road on May 17 against the Atlanta Braves at Turner Field. Van Slyke hit two home runs in the first game but Paco Rodriguez allowed a grand slam home run to Justin Upton and the Braves won 8-5. Chris Capuano pitched well the next day, taking a shutout into the 8th inning but reliever Kenley Jansen allowed back-to-back homers to Evan Gattis and Andrelton Simmons and the team lost again, 3-1. The bullpen surrendered the lead again the next night as the Braves completed the sweep with a 5-2 win. The Dodgers traveled to Miller Park for a series against the Milwaukee Brewers next. After 3 straight days of bullpen meltdowns, Clayton Kershaw picked the team up by pitching his 10th career complete game and only allowing 3 hits in a 3-1 victory. Ethier and Kemp homered in the win. The team reverted to form the next day as they stranded 14 runners in scorring position and Zack Greinke struggled in a 5-2 defeat. The offense finally came alive as the Dodgers wrapped up the road trip with a 9-2 win over the Brewers on May 22. The Dodgers returned home to play the 1947. However, he went 0 for 4 with 2 strikeouts in the series finale as Jason Marquis no hit the Dodgers into the sixth inning and the Padres won 6-2 to keep the Dodgers in last place in the division. 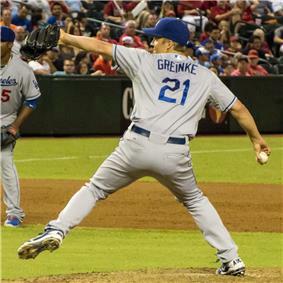 Zack Greinke pitched seven scoreless innings on June 6 against the Atlanta Braves and Puig continued his hot start by blasting a grand slam home run in the eighth inning to blow open the Dodgers 5-0 win. Puig homered again the next day, and became only the second player in the modern era with four homers in his first five games and he tied the Major League record with 10 RBI in his first five games. Hyun-Jin Ryu allowed one run on six hits in 7 2/3 innings and the Dodgers won, 2-1, when pinch runner Skip Schumaker scored on a wild pitch by Anthony Varvaro in the bottom of the 10th. The Braves won the next day, 2-1, as Kris Medlen pitched 6 2/3 scoreless innings and hit a solo homer. That was one of two homers allowed by Stephen Fife in the fifth inning. Matt Magill made another emergency start on June 9 as Ted Lilly went back on the disabled list. 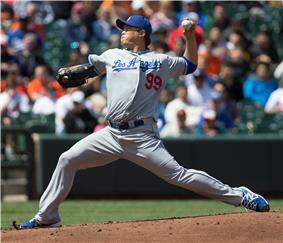 He walked six and allowed seven runs in 3 2/3 innings as the Dodgers lost to the Braves 8-1. Clayton Kershaw allowed only one run in seven innings on June 10 against the Arizona Diamondbacks but Brandon League was tagged for four runs in the ninth and the Dodgers lost 5-4. Puig had three hits on the day to move his batting average to .500 on the season. He became the first Dodger in history with 16 hits in his first eight games and the first with six multi-hit games in his first eight. The Dodgers beat the Diamondbacks the next day as Tim Federowicz three-run double provided the difference in the 5-3 win. The game was marred by five hit batters, two bench clearing incidents, and six ejections of players and coaches. The Dodgers ended their homestand with an 8-6 loss to the Diamondbacks in 12 innings on June 12. The Dodgers traveled to the east coast to begin a road trip with the Philadelphia Phillies at Citizens Bank Park. Greinke and the bullpen shut out the Phillies and Hanley Ramírez hit a two-run homer in the 4-0 win. Kershaw struck out 8 in 8 scoreless innings as the Dodgers shut out the Phillies again, 5-0 for their first 10 game win streak since 2006. The record of 42-8 over the past 50 games was the third best 50 game stretch in Major League history, behind only the 1906 Cubs and 1912 Giants. The streak was snapped the next day as Ramirez made two errors in the bottom of the ninth and the Phillies won 3-2. The Dodgers lost consecutive games for the first time since June 20–21 when they dropped the opener of a series against the Miami Marlins 6-2 on August 19 at Marlins Park. Yasiel Puig came off the bench and hit a solo homer to lead off the eighth inning as the Dodgers won the second game of the series, 6-4. Greinke pitched another good game the next day, allowing only one run in eight innings as the Dodgers capitalized on 3 Marlins errors to win 4-1. Kershaw followed that up by again pitching eight scoreless innings in the Dodgers 6-0 shutout of the Marlins to end the road trip. The Dodgers began a three-game series against the American League East leading Boston Red Sox at Dodger Stadium on August 24. 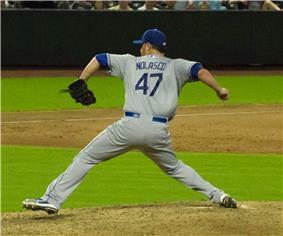 Ricky Nolasco and John Lackey both pitched eight strong innings, and only five hits were allowed combined. Hanley Ramirez two-run homer in the 4th was the only scoring in the 2-0 win for the Dodgers, which stretched their lead in the division to 10 1/2 games, the largest since 1977. Ryu allowed 4 runs in the first inning the next day, with the big blow on a 3 run homer by Jonny Gomes and the Dodgers never recovered, losing 4-2. The Red Sox won the series finale 8-1, the Dodgers first series loss since June 14–16. They had won or tied 18 straight series, a franchise record. Greinke got the Dodgers back on track after their two game slide, pitching 8 2/3 innings against the Cubs and also hitting an RBI single in the 6-0 win. The Dodgers offense was stymied by Cubs pitcher Travis Wood the next night and they lost 3-2. The team moved past 3 million in attendance this night, the first team in the Majors to reach that mark. Nolasco pitched eight shutout innings, while striking out 11, and Ramirez and Ethier both homered in the 4-0 win on August 28. The Dodgers 8 shutout wins in the month of August was the most by any MLB team in one month since the Dodgers did it in September of 1988. Yasiel Puig had four hits and Adrian Gonzalez hit two homers as the Dodgers pounded the San Diego Padres 9-2 on August 30, setting a new L.A. Dodgers record with 22 wins in a month, one shy of the franchise record set by the 1953 and 1957 Brooklyn Dodgers. Newly signed Edinson Volquez made his Dodgers debut, the 26th pitcher the team used this season, setting a franchise record. The Dodgers tied the franchise record for wins in a month the next day, as they finished August with a 2-1 win over the Padres. 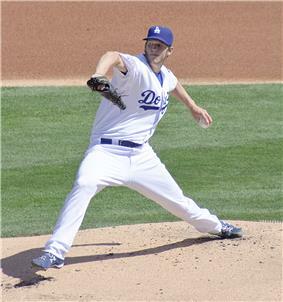 Clayton Kershaw had a rare poor performance in the opener of a road series against the Colorado Rockies. He allowed 5 runs and a career-high 11 hits, but the Dodger offense picked him up and the team continued winning, 10-8. Ricky Nolasco won his sixth straight decision, 7-4, on September 3 as Nick Punto had four hits and Carl Crawford had three hits and two RBI. The Dodgers dropped the series finale to the Rockies, 7-5, thanks to a poor first Dodger start by Edison Volquez, who allowed four runs in four innings of work. The Dodgers next traveled to Great American Ballpark to begin a weekend series with the Cincinnati Reds. Chris Capuano left the game in the second inning with a groin strain and the Reds won 3-2. A walk-off single by Todd Frazier in the 10th inning gave the Reds a 4-3 victory on September 7, sending the Dodgers to their first three-game losing streak since June 8–10. The Reds completed the sweep, 3-2, thanks to two home runs by Jay Bruce and a walk-off double by Ryan Hanigan. The Dodgers returned home on September 9 and smacked the Arizona Diamondbacks 8-1. Juan Uribe went had 4 hits, including 3 home runs, in 4 at-bats. He was the first Dodger to hit three homers in a game since Andre Ethier on June 26, 2009. The Dodgers as a team hit six homers in the game, the most since they hit seven against the Padres on September 16, 2006. The team won again the next night, as Scott Van Slyke hit a pinch hit walk-off home run in the 11th inning to give the Dodgers a 5-3 win. This was the team's first walk off homer by a pinch hitter since Olmedo Sáenz in 2007.